I always get super excited when I find out Jacksonville is getting new restaurants….or anything new for that matter so I was beyond thrilled when I was invited to the sneak peek opening of Hawkers Asian Street Fare last Friday night! Hawkers is an Asian Tapas restaurant originally out of Orlando that has opened up a home in the 5 points district of Jacksonville! The atmosphere is very hip and menu is massive! There were so many things I wanted to try but since I didn’t have anyone to share with, (which is highly encouraged here), I didn’t want to look like a complete pig …….came close though lol. Here’s what I got and no, I didn’t eat all of it in one sitting! Coconut Curry Shrimp: These were pretty good! I wasn’t crazy about the curry dipping sauce so I asked for some thai chili sauce as a substitute and it complimented the shrimp well. Asian Fried Green Beans: I loved these! It’s the kind of dish that you find yourself dipping into repeatedly but there’s no guilt because they’re green beans. The five spice flavoring is great! Vegetarian Spring Rolls: Whenever I eat anything Asian, I feel the need to order spring rolls or egg rolls. These were ok. The dipping sauce was missing a little something that I can’t quite put my finger on that probably would’ve made them pop a little more. Malaysian Satay Chicken Skewers: These were pretty good. I enjoyed the seasoning and eating them with the red onion and cucumber that garnished the plate..don’t judge me lol! Chow Fuun: This fried rice came with shrimp and chicken and it was delicious! Especially with a little Thai Chili Sauce drizzled over it! YUM! Honey Sriracha Wings: These bad boys were spicy but I love a little kick to my food! As I was getting ready to leave, a really nice couple insisted that I try the Roti Canai, this Malaysian flat bread that resembles a tortilla and boy am I sooooooo happy I did!!! If I had this for every meal of the day I would not complain. It was that good. It came with the curry dipping sauce but plain was just how I liked it! 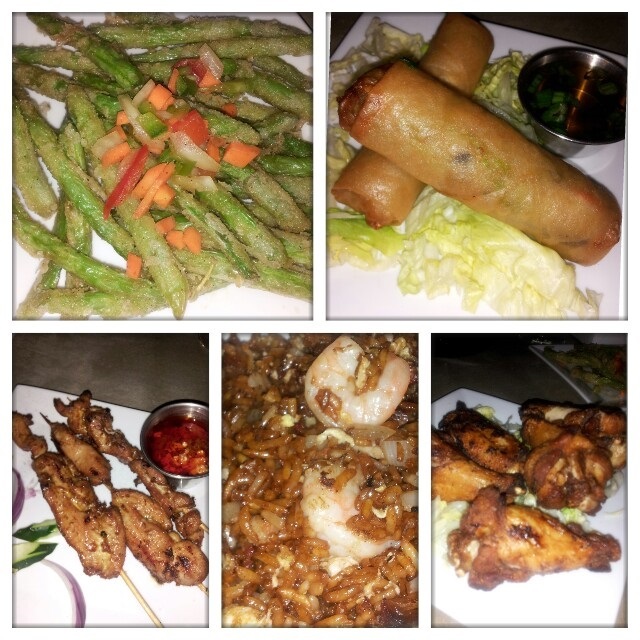 I think Hawkers is a great addition to the 5 points area and I really enjoyed my dining experience! The atmosphere was great, the servers and bartenders were awesome, the service was quick and efficient, and the food was wonderful! I definitely look forward to visiting again!